Earlier this week, I received my first, free hard copy book to review. I was pretty excited to get the book unfortunately the excitement was short-lived. 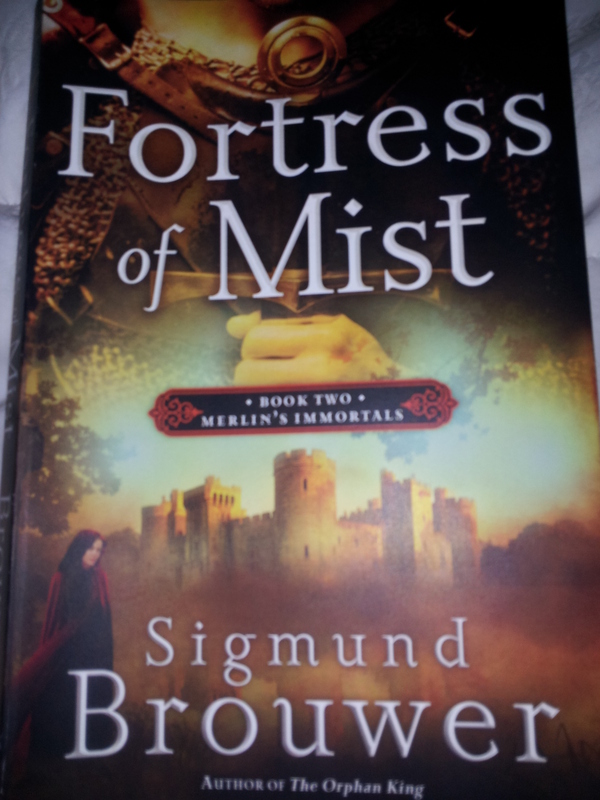 Here is my review of Fortress of Mist by Sigmund Brouwer. This is the second book the series of Merlin’s Immortals. The book follows the new Lord of Magnus, Thomas. Magnus is a land that is filled with supernatural evils. The people of Magnus are quite superstitious. Unfortunately for this young Lord, he is immediately tested and is forced out of the castle to assist with a battle against the Scots. As he is fighting his very human war he is also trying to learn more about the Druids and their supernatural powers. The plot line was quite intriguing to me. Unfortunately, that is where it ended. The chapters are extremely short probably averaging 2-3 pages each. This made the book seem choppy and disconnected. I also felt there were so many places he could have “fleshed” out the story more. Often times there wasn’t enough information for me to get a true understanding of the characters actions. This lead me to have very little connection to any of the characters. I felt confused during most of the book and had some difficulty really understanding how each character was connected. I didn’t read the first book in this series. If I’d read it, I may have a better understanding of the connection. However, I suspect this author’s writing style and lack of “fleshing out” the story would’ve been the same. It seemed as if the author was in a rush to finish the book and didn’t take the time to truly build a story. Ultimately, this book left me wanting more, and not in the good the way. I would not recommend this book. This book received 2/5 bookends. Since both myself and my husband work my children go to daycare. I am very satisfied with the daycare provider we have. We were quite lucky when looking for one a friend was able to recommend this one. There have been bumps along the way but we’ve been able to work through them. The one thing that’s very frustrating and one that I have very little control over is the other children and the things they are taught and over heard. Adults do not think before they talk around children. Sadly, not everything they say is age appropriate. This is so very evident with my almost 5 year-old. She comes home and repeats language we don’t use in our house. When questioned, she does openly tell me where she learned the new word. Often times she has no idea what the word means, she’s just repeating it as she’s heard. Keep in mind the words aren’t true “cuss words” but they are quite inappropriate. Going beyond adults using language not appropriate, they talk about topics which I don’t feel are age-appropriate. My daughter then comes home and tells me about what she’s learned from the other children. Each of those incidents have given me the opportunity to redirect my child or to educate her on our morals. I have a teaching moment. And each time, I shake my head at my child’s innocence lost. I wonder, what are those parents thinking? Can’t children just be children and not thrown into adult conversations and adult worries? My decision to place my children in a Lutheran school starting with kindergarten is reinforced each and everytime. Not that I believe this will be the absolute solution to this problem, but it will certainly help solve it. On one hand, I wish I wouldn’t have to have talks with my daughter so young on some of these topics but,on the other hand, I’m grateful. I’m grateful to have the opportunity to teach my children about right and wrong. I have the opportunity to tell my child about God and God’s love. I pray that I will continue to recognize the opportunity to witness to my children. I pray for ongoing wisdom to know how to address these issues appropriately. Has your child said something that made you wonder where she’d learned it? How did you address this? Mommy, Can You Pat my Bum? We like the mundaneness of routines in this house. It’s good for the kids and good for us. We all know what to expect when we wake-up and when we go to bed. I know some people may be cringing right now thinking our life must be awfully boring. Please don’t! We start and end the day in a routine, we eat our meals routinely but we don’t live a boring life. Our kids are rambunctious. We are spontaneous. However, we need to be able to get the kids up and dressed five days a week for daycare. We must get them in bed at a decent time so we can get them up. Everyone does their night-time routine differently. I’ve got friends on both sides of the, what I like to call, the night-time misery spectrum. On the left side of the spectrum you’ve got the co-sleeping, baby/child doesn’t have a chance to whimper people and on the right side you’ve got the cry it out for hours people. I know, I’m being a bit exaggerant. I do believe being to extreme either way can be, well, problematic and cause bedtime woes. I’m somewhere in the middle, probably more left than right. My daughter whose 4 almost 5 has a different routine than her brother whose 2 going on 3. My daughter’s routine is brush teeth, we read a book and then say prayers. She keeps a night-light on after we leave. She listens to Chris Tomlin’s CD and quietly looks at her book until she falls asleep. My son gets his medications, brushes his teeth, we snuggle and read a couple of books and then say prayers. 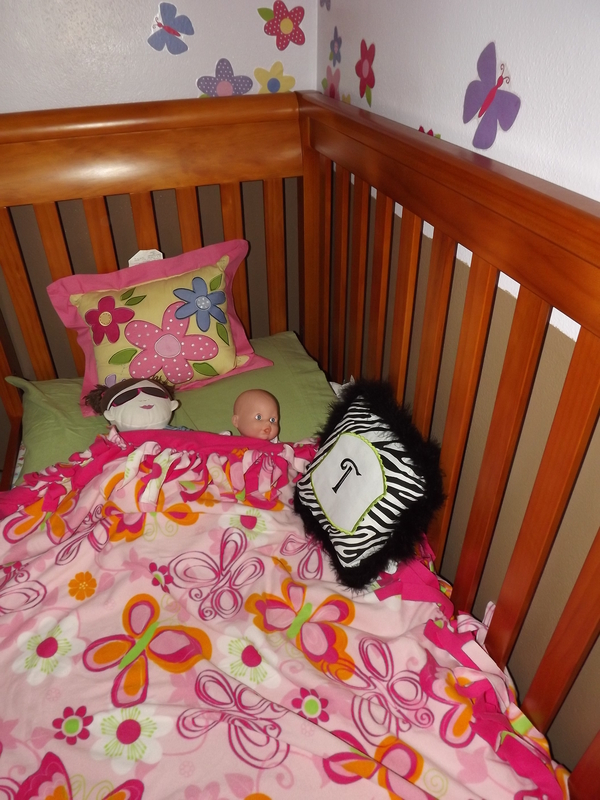 He crawls into bed, I turn on the lullaby CD. I say good-night leaving him with a book. He’ll either lay there for a while and then call me back into his room or he’ll immediately ask this question: Mommy, can you pat my bum? I sit with him until he’s almost asleep and pat his bum. Now, on occasion if we’ve had an unusually busy day and my daughter can’t quite settle down or if she’s had a nap, she will call me into her room. Her request is simple, Mommy, can you pat my bum? I, without hesitation sit down and pat her bum. I know those on the right are shaking their heads at me. 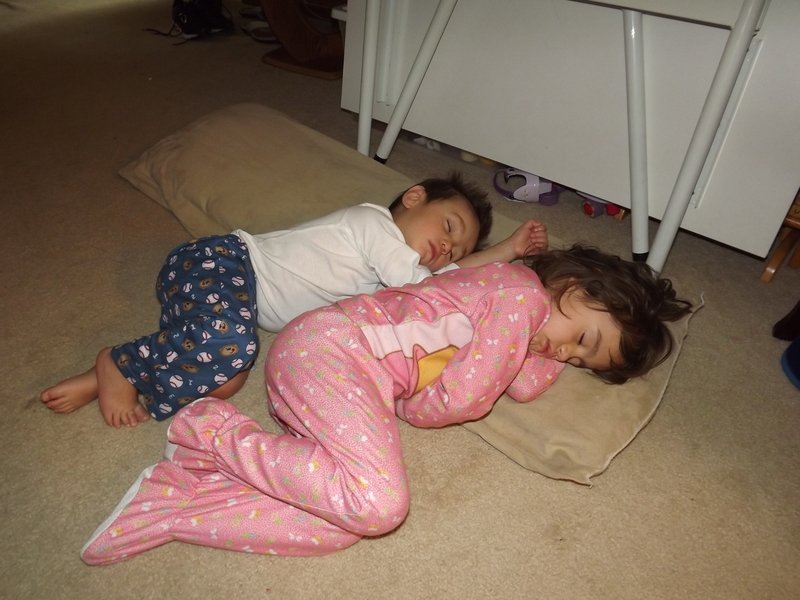 But, the truth is, it won’t be long before they won’t need their mommy to do such things And, quite frankly, I want to hold on to the sweet moments of watching my babies fall asleep as long as possible. I am also teaching my children they can count on me. They are important to me, they’re requests and needs are important to me. And those lessons will last into their teenage years when I want me kids to come to me with their needs. And so, this little investment of love and time, will pay off in the future. With everyone giving out their opinions on how a bedtime routine should look, it can be easy to get wrapped up in the spectrum. It can be easy to worry and stress over whether you’re doing it right. I know, my style is very different from most of my friends. And with everyone wanting to give me their opinion on how I put my kids asleep, I could find myself running in circles trying to do everything “just right”. But, I’ve got a secret for you…It doesn’t matter what other people are doing. It doesn’t matter what works for your friends. What matters is what works for your family and your kids. So as long your kids end up doing this…. And you’re not stressed, you should know, you’re doing it right! I finished this book within 4 days. Since I’m a full-time mom and work full-time, that’s pretty amazing. I knew I needed to finish reading it by this weekend so I could start the bookclub book. I was also looking forward to reading it as its my first time reading a book and reviewing it for blogging for books. Blogging for books is a new adventure for me. It’s a website that allows you to get free copies of books for a written review on your blog, one other merchant site (Amazon, B and Noble, etc) and on their site. 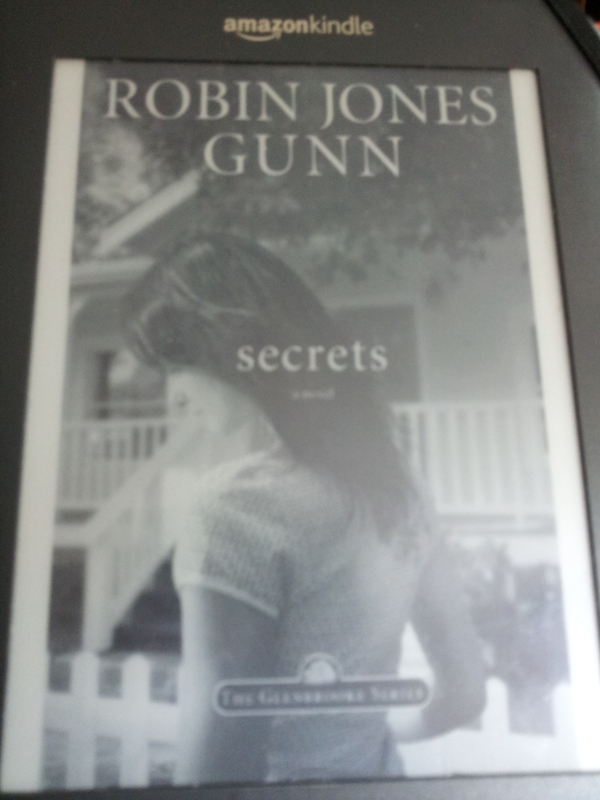 Secrets by Robin Jones Gunn is ultimately a book about self-discovery and independence. The book follows Jessica as she moves into a new town with the hopes of a new start. She is carrying a secret with her. On her way to the new town she has an accident which leads her to meet the handsome Kyle. She attempts to conceal her identity from all those she meets. This includes Kyle despite her growing feelings for him. Her poor planning promotes maturity and growth as she adjusts to her new life. She eventually learns she must face her secrets in order to truly move on her life. This book was quick read. I read it in just a short few days. It was enjoyable book. At first glance it seems to be quite a simple story however, if taking to time to really evaluate it, one would find more depth. The characters are well-developed and I felt pulled into the story. Christianity was weaved wonderfully throughout without sounding preachy. This book had two flaws that I kept coming back to and unfortunately they relate to the premise of the book. The main character was running away but she only took 300 dollars and she went to a town without first creating an identity. She is someone who from early on in the book you gather comes from wealth. I couldn’t figure out why, logically she would’ve left with so little cash. And, if she came from wealth, it would’ve been easy for her to obtain something of an identity. She still had her old license and didn’t change her name until she was actually in the new town. Now with those flaws, it could easily be said that it was part of her character. She’d never really lived on her and really was quite naive. Even with that flaw, I felt the book was quite well-written and enjoyable. This will be an author that I would read again and I would recommend this book to someone looking for a quick read. This book was provided to me for my Kindle free of charge by Blogging for Books and I was not required to positive review. This book received 4.5/5 bookends. Thrifty Thursday (4): Let’s Date! It’s hard to find a time and the finances to go out on a date with your husband. I and my husband went on our first real date in a long time on Valentine’s Day. It happened quite quickly I don’t think we really had an option to say “No”. My sister-in-law arranged for us to go on a double date and set-up a babysitter who took a bottle of wine as payment which my sister-in-law paid promptly. We went to a local restaurant where my other brother-in-law (my husband has 7 siblings!) worked, it was much nicer than we usually eat. Since we’d not been out in a long time, we’re talking a year, we spent more than we ever would’ve dreamed of doing. 1) Rent a movie: Dollar red box is always a bargain. But don’t forget your local library may have deals too. If you subscribe to Netflix or a DVR service, you could save money by using services you already pay for. Don’t forget the popcorn! Go for the bag of kernels and pop your own over the stove to add some additional fun while saving some money over the microwave popcorn. 2) Do Breakfast: We have a couple of donut shops in town and are planning a breakfast date for coffee and donuts. Don’t have the luxury of going out to breakfast, arrange your morning routine to get up a bit early and enjoy a breakfast at home. You could make a breakfast casserole the night before and warm it up. 3) Play together: Having a relaxing afternoon or evening playing a board game, cards, or video games gives you a chance to relax and laugh together. Choose something you both enjoy and, if possible, something you use to do when you dated. 4) Go on a Picnic: You could even take the kids with you on this! Plan an easy to carry menu and if you have kids, kid friendly options. Choose somewhere that has a quiet place you can put down a blanket. If you’ll have the kids, make sure it’s somewhere they can safely play. If its more secluded with no playground equipment (which would be nice!) bring outside toys for them. After quickly setting up boundaries for the kids (no further than that tree or stay where we can see you), you and your husband can sit and enjoy each other’s company. 5) Eat Late! : This may not be good for a diet but its a great way to get some time with your husband. Feed the kids something easy, wear them out and put them in bed a little early. Once they’re settled, get your supper on the table. I recommend cooking something while you go through your evening routine. This way its ready when you are (get the lasagna in the oven when you’re putting the kids in bed or have the salad chopped and ready to go). To add the atmosphere of a fine restaurant, shut off the lights (or lower them) and light some candles. 6) Adult Only Dessert: If waiting to eat isn’t an option, make a nice desert and eat that later with your husband. Pick a dessert you both like or alternate between each of your favorites. 7) Do Something Active: So, this may not sound like your idea of a romantic time. But it really can be fun and a great way to grow closer. Plan to do a 5K walk/jog/run together. You might have to train separately if you’ve got kids. You can help cheer each other on, support one another. It will give you something to look forward to. The day of the event you will see each other’s hard work pay off. And if you’re walking together its a great way to get time to talk and relax together. Want something less competitive? Try riding bikes together. This is a pretty stressless activity that you can start right away with a short ride around the neighborhood. Evening walks are always relaxing. 8) Sit on the Porch: In the summer one of my favorite things to do is sit on the porch and while sipping on some ice tea watch the lightning bugs. When I lived in a small town, I’d be greeted with the neighbors coming and going. Living in the city, now my porch is much more secluded as it faces the back yard. If the kids are in bed, I’m close enough that I can bolt in there quickly. If they’re still up, they can safely play in the yard while my husband and I watch from our comfy porch spot. 9) Do Lunch: Lunch meals are often cheaper than supper or dinner time meals. Why not grab lunch with your husband? You can avoid the crowds by going on off times such as 11 or 1. If the meal out is not in the budget, try meeting at home and sitting down at the table and eating together. If the weather is nice, each of you pack a lunch and meet in a park. 10) Take advantage of a Babysitter: Now, I don’t mean financially or exploiting their time. I do mean if you’ve already scheduled a babysitter take advantage of the time and sneak in a quick lunch or dinner. We’ve been known to hire a babysitter so we could get our taxes done. Since we’ve already got one and paying her, we’ll grab a quick lunch on our way home. Thus taking full advantage of what we’re already paying for. If grandma volunteers to babysit on Saturday for a few hours so you can clean the house, grab a dinner with the hubby before picking-up the kids. I’ve not done all of those date ideas but they are certainly ones I’m hoping to try sometime. I believe the best frugal dates are ones that are personal to the couple. They are ones that emphasize your relationship. What creative date nights have you had? I’ve always had a passion for reading. Once I learned to read, I didn’t stop. In school I read well above my grade level. In junior high, I was checking out books from the high school side of the library. The library lady looked at my selection, raised and eyebrow, and began to question my choices in books. 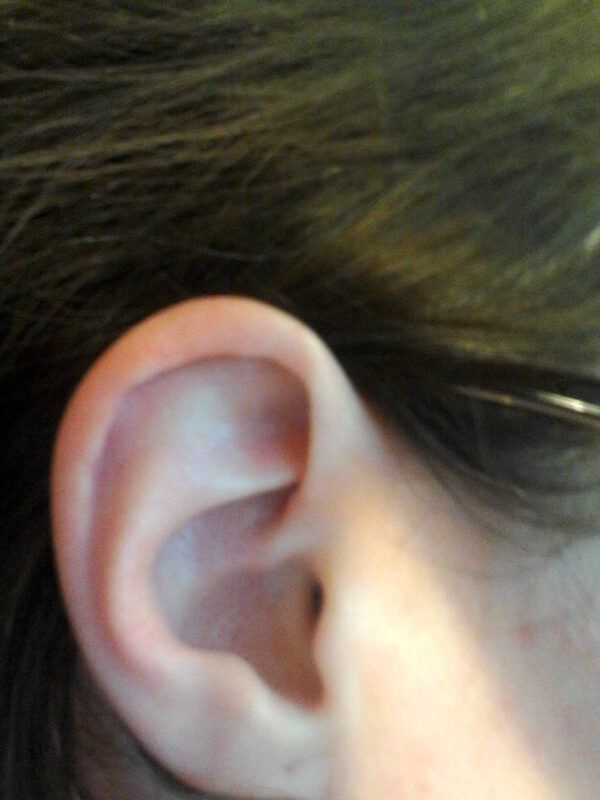 Although, hesitant she let me check them out. She was very surprised when a few days later I returned the “a little too old book” and checked-out yet another. This time, she questioned me about the books. I’m guessing she didn’t believe that I actually read them. I must have satisfied her curiosity because she then stopped questioning me. Well, in the accusing way. Her questions were more, intellectually based. If that makes any sense at all. I as also that nerdy kid who truly LOVED all of the books that we were “forced” to read in English class. Yeah, I love reading and not just reading. I love the discussion of books and evaluation of the book itself. And tearing apart the plot and characters. Yeah. I love to read. I find Joy in books. Sadly, my reading slowed way down in college and the years following. A couple of years ago for Christmas, my husband bought me a Kindle when my hunger for books returned. I have this habit of collecting books. Even though it was a perfect gift for me, it really was a perfect gift to himself. He no longer had to see all the books I was collecting. Now, I read a lot. I read mostly on my Kindle. I do check out some books from the library and borrow some traditional books from friends. 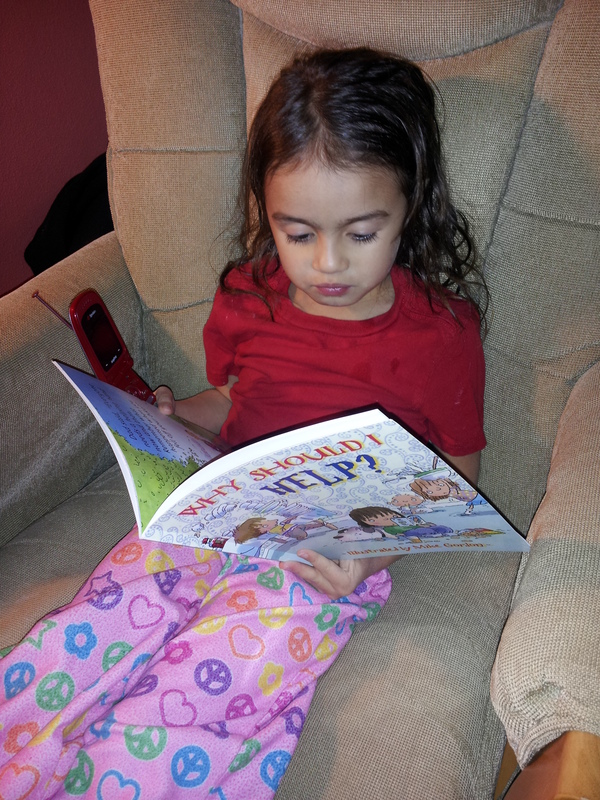 Since, I so obviously love reading, my heart surges as my 4 year-old wants to read. OK, WANTS may not totally describe her sentiment. She desperately wants to read. She loves books. She likes to follow with her finger as I read to her. She likes to “read” with me by repeating after me. She is always asking what signs and anything with writing says. I really want to encourage her so she too will find Joy in reading. 3) Continue to quiz her on the letters (upper and lower) and sounds letters make- Maybe flashcards? What have you done to help your child read? Any helpful tips? I mentioned several posts back that I joined a book club at my church. I really am liking it. It helps to force me to read. That may be a bit harsh since I love reading. What it more does is force me to make time for reading instead of watching TV or putting the dishes away or sleeping. The book choices are all Christian based novels. Its introduced me to new authors and I’m loving that! 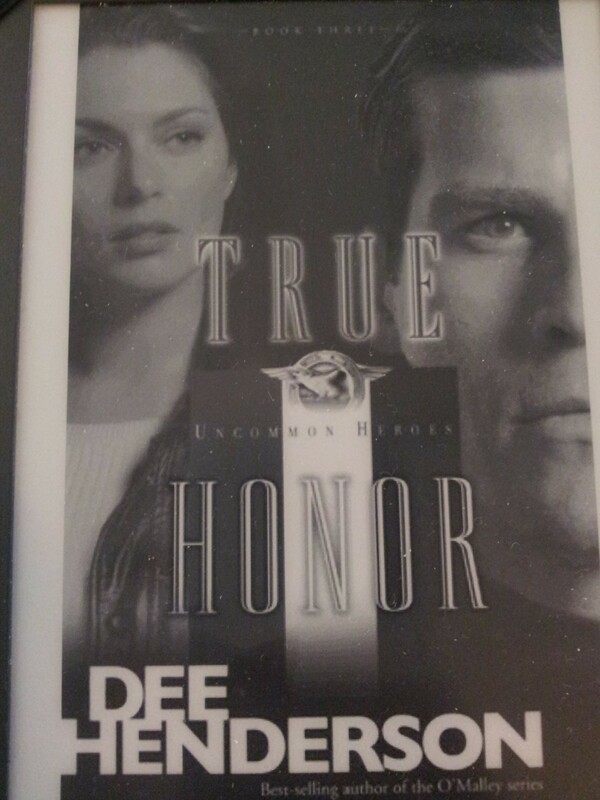 Last month’s choice was True Honor by Dee Henderson. I really enjoyed it. Here is the review I wrote for Amazon. This is the first book I’ve read from this author. It was well-written and a good read. I really enjoyed that the characters interactions seemed genuine especially when discussing their faith. I don’t typically read spy books or military based books because so often they seem very unrealistic. I feel this book did a good job representing that there isn’t always neat action-filled moments in the spy business. It demonstrated the paper trail and more boring parts of being a spy. That was nice. I do agree with some of the other reviewers it did seem to drag on in parts- especially towards the end. The romance exchange between Darcy and Sam were very Christian based, so if you’re looking for more spice, this wouldn’t be for you. I really liked the author’s writing style and plan on reading another one of her novels. This month we’re reading A Skeleton in God’s Closet by Paul Maier. I’m really looking forward to it. It sounds like it’s very similar to the DeVinci Code which I’ve not read but have watched and enjoyed the movie. What have you been reading? Anything good?